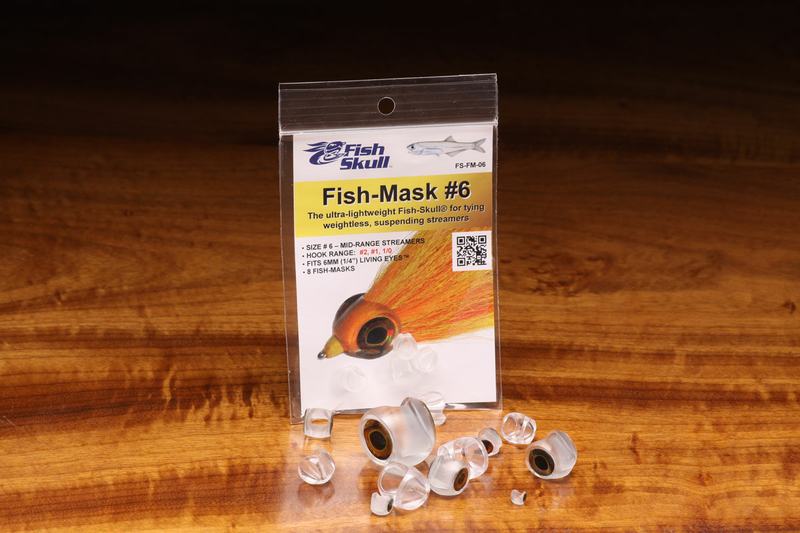 Description Fish Mask's are designed to make creating prominent heads and eyes on streamers. They are incredibly easy to use and allow you to apply great looking eyes to create targets for fish seeking baitfish style fly patterns. Fish Mask's are weightless and extremely durable. They are clear and made from a clear fluoro epoxy material. The color of you fly materials will show through the Fish Mask. Fish Masks are designed to accept Fish Skull Living Eyes. You will find a chart describing sizes in terms of what matches what in this description. The eyes that fit the Fish Masks are sold separately and are easily applied with clear cure goo. Here is much more info courtesy of the guys at Flymen Fishing Company the creators of Fish Masks and so many other cool fly tying materials. size 3 for hook sizes 10-6 flies 12 per pack- size 4 for hook sizes 8-4 10 per pack, size 5 for hook sizes4-1 10 per pack, size 6 for hook sizes 2-1/0 8 per pack, size 7 for hook sizes 1-2/0 8 per pack, size 85 for hook sizes 1/0-3/0 8 per pack, size 10 for hook sizes 4/0-6/0 6 per pack, size 15 for hook sizes 5/0-9/0 6 per pack. Eyes� (3mm-15mm). Tie any streamer size from a #10 up to 8/0 hook size! Quick-and-easy, front-fitting tying technique. Easily combined with articulated shanks. No mess! Q: What problems does the Fish-Mask solve? 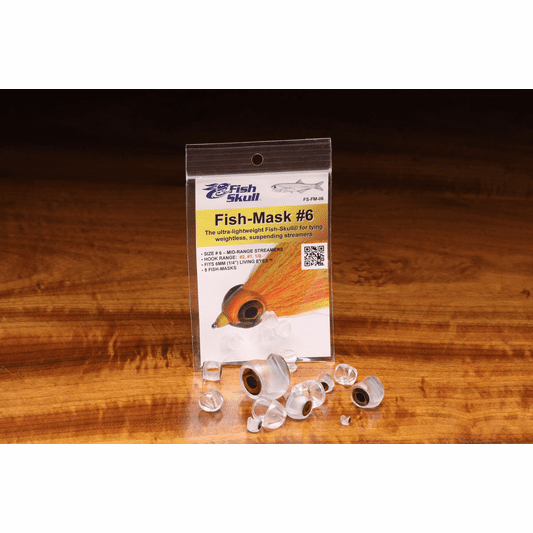 A: The Fish-Mask� is essentially a pre-molded, epoxy head for streamer flies. It is clean, quick and simple to tie with and completely eliminates the hassle, mess and shape/size/weight inconsistencies associated with using 5-minute or light hardening epoxies. No toxic fumes. No mess. No more drying wheel. Consistent size, weight and shape of the head reduces your tying time by half! A: The Fish-Mask holds and protects the eyes of the fly solving the common problem of stick-on fish-eyes falling off when you hook your first fish. Use Clear Cure Goo Hydro or super glue to seal the eyes deep inside the mask. 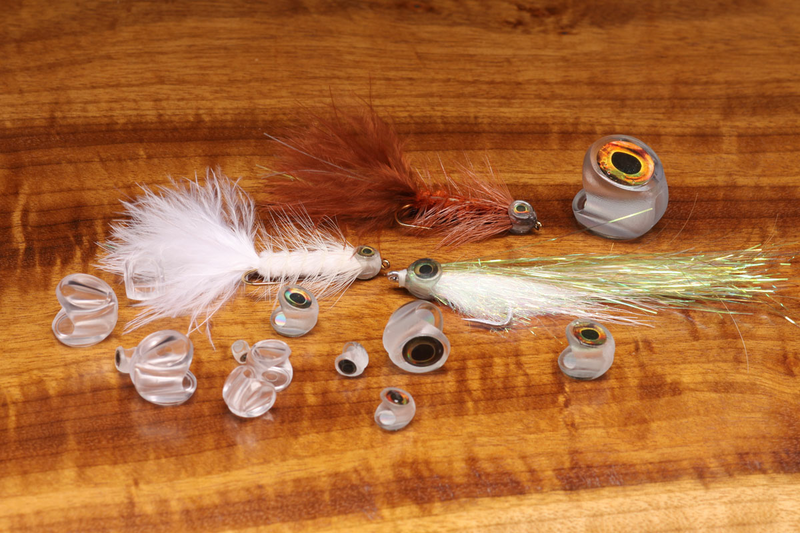 Q: What types of flies can be tied using the Fish-Mask? A: The comprehensive range of 8 different Fish-Mask� sizes allows you to tie virtually any size of salt or freshwater streamer_from the smallest of trout flies (example #10 hook) right up to the largest, predator flies (example: 7/0). Q: Are Fish-Mask� flies easy to cast? A: Yes, the lightweight Fish-Mask is almost weightless and has an aerodynamic shape making it easy to cast. A: The density of the material is slightly thicker than water which means it will sink very slowly. This is perfect for creating weightless streamers that will suspend in the water column. Q: What does the Fish-Mask range consist of? 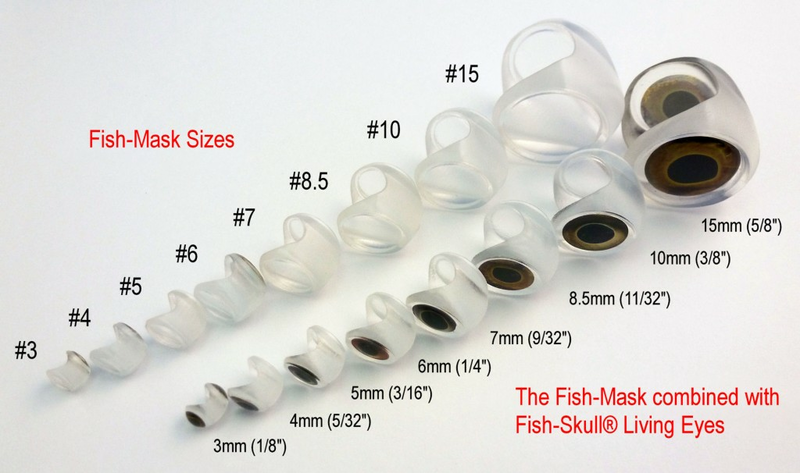 A: The Fish-Mask range consists of 8 sizes that directly correspond to the 8 sizes of Fish-Skull Living Eyes. These head sizes are categorized accordingly for Small , Mid-range, or Big Game/Predator size streamers. The Living Eyes are sold separately. Q: What is the quick-and-simple tying method? A: The Fish-Mask is tied using the same innovative front-fitting tying method that Flymen Fishing Company introduced to the industry in 2010 when we launched the original weighted Fish-Skull�. � First: Tie the entire fly (tail, body, flash materials etc) onto the hook (or articulated shank) leaving a small gap behind the eye of the hook. Tie off your materials in the usual way creating a large thread head in the process. Add super glue (or Clear Cure Goo Hydro) to the thread wraps. � Second: Fit the head (the Fish-Mask�) from the front of the fly and position the Fish-Mask� in place against the materials as desired. Note: If you use Clear Cure Goo, your UV light will shine right through the Fish-Mask and cure the goo within 8 to 10 seconds! A quick and efficient method to secure the Fish-Mask to the fly. � Third: Re-attach your tying thread between the Fish-Mask� and the eye of the hook and wrap a small thread-dam. Tie off your thread and add head cement. The thread head locks the Fish-Mask� firmly in place making it absolutely impossible to come loose. Fourth: The fly is then completed by adding fish eyes to the eye sockets. This quick-and-simple tying method allows even novice tiers to tie effective, good looking streamer fly patterns. Q: Why are the deeply embedded eyes sockets a key feature of the Fish-Mask? A: Eyes are one of the most prominent features of any baitfish pattern acting as a trigger for the predatory species being targeted. The eyes sockets are designed to securely position, hold and protect the fish eyes in place. A: Each size of Fish-Mask is designed to correspond to the range of Living Eyes�; however, almost any type of 3D or stick-on fish eyes may also be used. This flexibility enables fly tiers to use whatever color or style of fish eyes best suited for the fly pattern they are tying and opens up endless possibilities for creativity. Please note that the Living Eyes are sold separately. 1. We highly recommend using Clear Cure Goo Hydro to seal the eyes in place. This is our preferred method as The Clear Cure Goo Hydro completely covers and then seals the eyes in place deep inside the eye sockets to produce a very realistic, professional finish. The eyes will never come off! Simply place the Living Eyes� in the eye socket, cover them completely with some Clear Cure Goo Hydro and then hit it with the light for 8 10 seconds to cure. You will love the result. 2. The second method is to use clear drying super glue in the base of the eye sockets and then stick the Living Eyes� in place. Done correctly, this is a very quick and effective technique. Q: Can the Fish-Mask� be combined with an articulated shank? Fish-Skull Articulated Fish-Spine. Q: What is the Flymen Big Game Fly Solution? A: We believe that the combination of a large size Fish-Mask (Sizes #10 or #15) + Living Eyes (10mm or 15mm) + Chockletts Articulated Big Game Shank� provides the key building blocks or platform upon which large, Big Game Flies can be built.